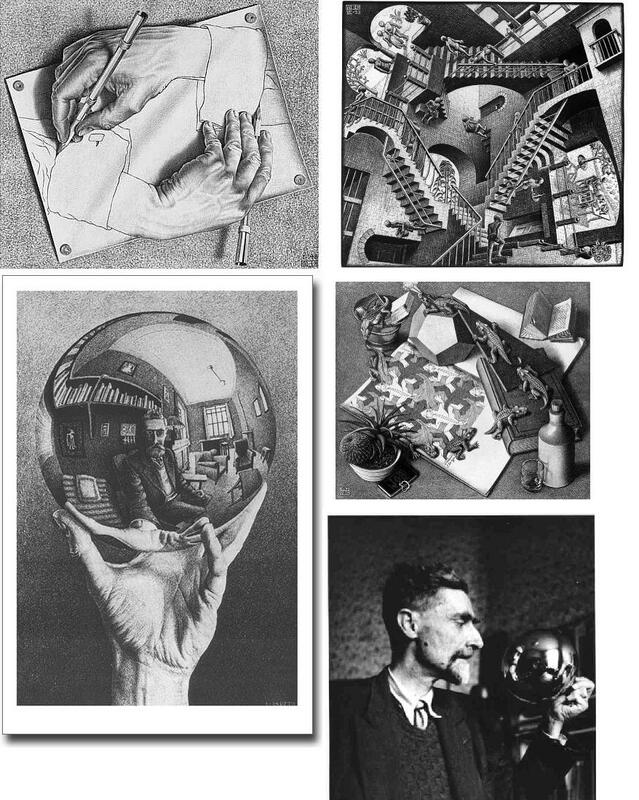 Much know as Escher, this dutch artist was nominated the best drawing artist of the 20th century. I admired all of his draws because he has the hability to pass to the paper everything he sees ,and beyond, with a perfection that its hard to describe, only looking at one draw of him to understand. He used to use diferents points of views in one draw. I admire him because I wonder how a person like him used to see the world?what are his interpretentions about everything, because everything that our eyes can see he defenetly understand, but he creates a diferent perspective of things and objects. Thats why he’s my idol, he could see the world in 1900 that we see now. He was a guy that was beyond his era. He defenetly revolutionate the drawing art for ever. Every draws that he made was with a pencil, only with a pencil and one color he created a whole interactive world of dimensions and reality. I like things that are not from the standard padron, and Escher knew how to mix different reallitys and dimensions. I had never heard of Escher before reading your comments about him. I do agree with you that he is (or was) a great artist, with an accurate vision of details and who probably saw the world around him very differently than you and I see it today. Unfortunately, I was never forced to take any art appreciation classes in high school or in college, so I am very ignorant when it comes to appreciating art. Maybe it is not too late for me to get started, but I still need to find the appeal of actually visiting art exhibits and museums around São Paulo. Another factor that makes it even harder for me to go is that Ana also does not appreciate art much. So, it is hard to just go alone and check out stuff that you have not been prepared to appreciate, don’t you think? hey man, you’re totally right! with the poor education that the traditionals schools pass to the students it’s hard to see the beauty beyond math and chemestry. everybody has the logical thinking, but waht about the creative side? I studied on Waldorf Rudolf Steiner for 2 years, this school would defenetly opened up your eyes to the art world man. If you really cares about it you can take pratical and theorics classes of art in many places of São Paulo, or you can ask me somethings, I do understand a littlle bit of it and I could give you some tips.